ASBXI CONFIRMATION/INFORMATION HAS BEEN SENT OUT! We sent out confirmation and event information. If you haven’t received yours, email us. We will send you a copy. JUSTDRIFT | charlie@justdrift June 28, 2011 | Comments Off on ASBXI CONFIRMATION/INFORMATION HAS BEEN SENT OUT! ACT + ASBXI + TEAM TANDEM = CASH PRIZE! ACT is awarding the TEAM TANDEM! 9K Racing also awarding parts for 1st, 2nd and 3rd place! BOOM! Team… let’s get ready to party! JUSTDRIFT | charlie@justdrift June 17, 2011 | Comments Off on ACT + ASBXI + TEAM TANDEM = CASH PRIZE! JUSTDRIFT Welcomes ACT as Co-Title Sponsor for 2011-2012 season! 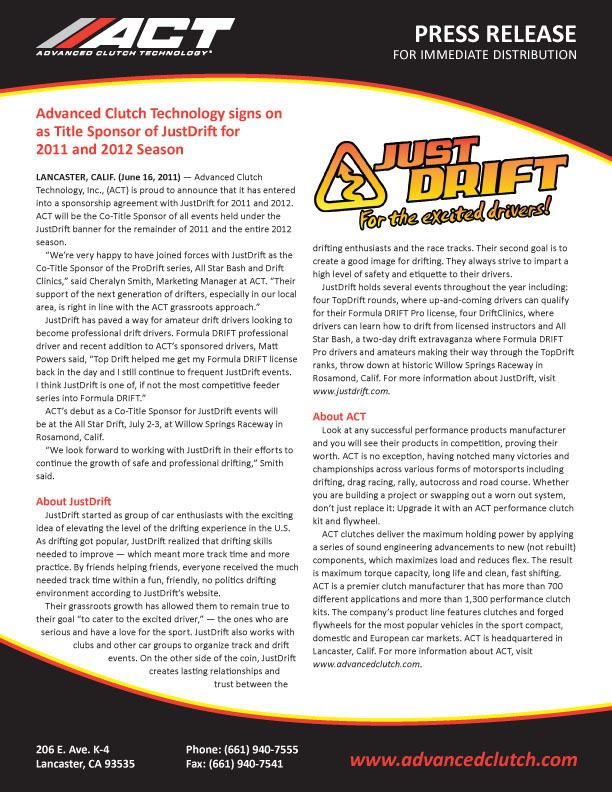 LANCASTER, CALIF. (June 16, 2011) — Advanced Clutch Technology, Inc., (ACT) is proud to announce that it has entered into a sponsorship agreement with JustDrift for 2011 and 2012. ACT will be the Co-Title Sponsor of all events held under the JustDrift banner for the remainder of 2011 and the entire 2012 season. ACT’s debut as a Co-Title Sponsor for JustDrift events will be at the All Star Drift, July 2-3, at Willow Springs Raceway in Rosamond, Calif.
“We look forward to working with JustDrift in their efforts to continue the growth of safe and professional drifting,” Smith said. JustDrift started as group of car enthusiasts with the exciting idea of elevating the level of the drifting experience in the U.S. As drifting got popular, JustDrift realized that drifting skills needed to improve — which meant more track time and more practice. By friends helping friends, everyone received the much needed track time within a fun, friendly, no politics drifting environment according to JustDrift’s website. Their grassroots growth has allowed them to remain true to their goal “to cater to the excited driver,” — the ones who are serious and have a love for the sport. JustDrift also works with clubs and other car groups to organize track and drift events. On the other side of the coin, JustDrift creates lasting relationships and trust between the drifting enthusiasts and the race tracks. Their second goal is to create a good image for drifting. They always strive to impart a high level of safety and etiquette to their drivers. Look at any successful performance products manufacturer and you will see their products in competition, proving their worth. ACT is no exception, having notched many victories and championships across various forms of motorsports including drifting, drag racing, rally, autocross and road course. Whether you are building a project or swapping out a worn out system, don’t just replace it: Upgrade it with an ACT performance clutch kit and flywheel. JUSTDRIFT | charlie@justdrift June 16, 2011 | Comments Off on JUSTDRIFT Welcomes ACT as Co-Title Sponsor for 2011-2012 season!